An RSS feed is a summary of a website’s frequently changing content. One example of this is the list of a blog’s recent posts. Besides RSS, News Anchor also supports reading news feeds in the ATOM format. A channel defines the news show broadcast. It determines the collection of RSS articles that will be read out, their reading order, and how many articles will be taken from each feeds. A channel typically has more than one feed and a feed may be assigned to multiple channels. Furthermore a channel defines how often News Anchor will generate an episode for it, which may be hourly, daily, or weekly. An episode is an instance of a channel. It contains the actual article text obtained from the news feeds of the channel and their images if any. Episodes are generated periodically when news anchor is running. I have added a feed to a channel but when I play the episode, the new RSS feed is not displayed. Why? 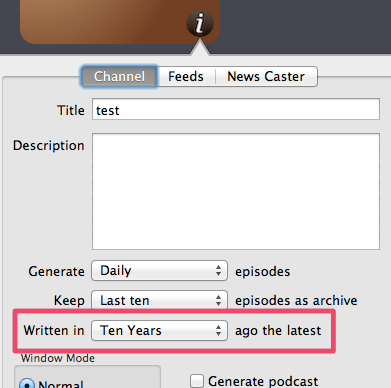 Changes to an RSS feed subscription will only be visible when the next episode is generated. If you would like to see your changes, press the Refresh button on the tool bar to refresh feeds and generate channel episodes – your changes should be visible in the new episodes that are generated. Is there a way of having the articles read continuously without having to press Next Article? Yes there is. Actually all articles within a channel episode is read continuously by default. You only need to press “Next Article” if you don’t like the current article being read and want to skip to the next article. Similarly you can have the previous article re-read by pressing the Previous Article button. I turned on the ‘Generate Podcast’ and the ‘Add to iTunes’ checkboxes but nothing happened? You will need to click on ‘Refresh’ to actually create the podcast files. Podcasts are created along with its channel episode. If currently you don’t have any channel that’s due, you’ll need to wait until the next time the channel is generated. What are the news feeds most appropriate to News Anchor? Why does News Anchor only reads the headings or only reads the summary on some feeds? Some feed publishers does not provide the full article in the RSS/ATOM feed and only provide the heading/summary instead. On these kind of feeds, News Anchor can only read out what the feed publisher provides. You can open the feed in Safari to check whether it provides the full article or only its summary. Help! I Keep getting “there are no episodes” error when playing my new channel. First, try ensuring that your Internet connection is working then start the refresh cycle. If you still keep getting no episodes generated, likely that the RSS feeds in the channel weren’t updated recently. If that’s the case then you will need to extend the cut-off period of that channel. The default cut-off period is one week — which means the channel will not generate new episodes out of articles written more than one week ago. To make the channel use old articles in the feed, click on the “i” button on the channel and change the “written in” drop-down box. Try setting it to the maximum of ten years ago (see screenshot below), so that it can pick up those really old articles. How do I change the speaking speed of the virtual News Anchor? Simple, just open Preferences in the application menu (the bold item that reads News Anchor to the right of the Apple icon). There is a slider there to change the speaking rate of the news anchor character. Cepstral voices (as of version 5.2.0) are known to have compatibility issues with News Anchor. Please try InfoVox voices instead (they have 30-day free trial period of their voices). If you want German voices, InfoVox Klaus and Julia voices (version 2.0.1) have been tested to work with News Anchor. Can I install News Anchor on multiple computers? Only if you are the sole user of those computers. If the other computer is used by another person and he or she is also using News Anchor, then that person will need his or her own license. We have discounted bulk licenses available, please, please make use of it. Sure, if you an Apple employee or you are an employee of a computer store that also sell Macintoshes, just ask us for an NFR license. Likewise if you are a blogger or other members of the press and wants a license for review purposes, just ask us. Yes, we have other applications available. Please check Basil Salad Software website for more details.